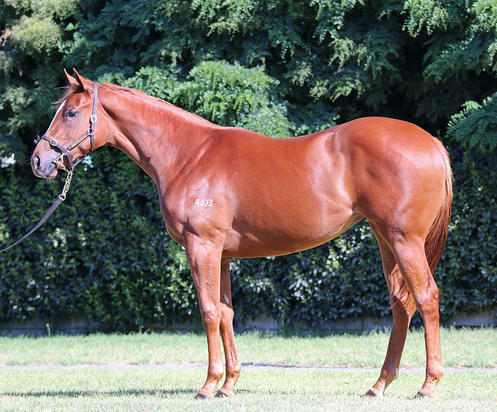 Chestnut filly by the triple Group 1-winning Exceed And Excel stallion Helmet, already a Group 1 producing sire. The filly is the fourth foal of the dual-winning, half-sister to the Group 3-winning, Group 1 placed Angel Of Mercy. From the Mill Park raised family that has produced four-time Group 1 winner Divine Madonna and the Group 3-winning, Group 1 placed Blessum, this filly is by Delago Brom who as a broodmare sire has recorded 27 individual winners from a small sample size of mares highlighted by the multiple stakes performer Varian. HELMET (AUS) (Chestnut 2008-Stud 2012). 6 wins-4 at 2, MRC Caulfield Guineas, Gr.1. Leading First Season Sire in Ire. in 2016. Sire of 267 rnrs, 120 wnrs, inc. SW Thunder Snow (Saint-Cloud Criterium International, Gr.1), Anda Muchacho, Archives - Lean Ambassador (H.K. ), Limestone, Met Spectrum, Eqtiraan, Taamol, SP Crossing the Abbey, Mur Hiba, Malaise, Boater, Wingingit, Igitur, Coppergate, Sunquest and of Cheeseandpickle, Athlete, Bongrace, etc. Smart Enough (f. by Smart Missile). Winner at 1150m in 2017-18 in Aust. Ronda Paradise (f. by Choisir). Winner at 1000m in Aust. ANGEL OF MERCY (Hussonet). 6 wins from 1300m to 1600m, A$531,575, BRC Lord Mayor's Cup, Gr.3, Northam Cup, L, ATC James HB Carr S., L, BRC Members' H., L, ATC Schweppes P., BRC Channel Seven H., 2d Qld Tatt's RC Tattersall's Tiara, Gr.1, WATC Konica Minolta H., Wyong RC Magic Millions Wyong 3YO S., 3d ATC Emancipation S., Gr.2, VRC Vanity S., Gr.3, 4th VRC Herald Sun S., Gr.3, Bunbury S., L.
Bowerbird. 3 wins to 1400m, SAJC Sportingbet H., Portobello Magic H., 2d SAJC Projection Graphics H., Sportingbet H., 3d SAJC Gaucho's Restaurant H.
Rondanini. 2 wins. See above. MATERNAL (Street Cry). 6 wins-1 at 2-to 1400m, A$238,135, to 2016-17, Ipswich TC Gai Waterhouse Classic, L, ATC Cellarbrations 2YO H., BRC Ambassador Travel H., MRC Toronado at Swettenham H., 2d MVRC LF Sign Group H., 3d ATC Tab.com.au H., MRC M&D Dillon Constructions H., MVRC William Hill H.
La Pieta (Redoute's Choice). 3 wins-1 at 2-at 1200m, 1400m, A$170,490, ATC Blackwoods Apex Tools H., Tab.com.au H., 2d GCTC Silk Stocking H., L, ATC Thoroughbred Rehabilitation Trust H., Testa Rossa at Vinery H., 3d Gosford RC Belle of the Turf S., Gr.3, ATC Mitsubishi Mirage Mile H., Drummond Golf H., MVRC Melbourne Signage Concepts H.
BLESSUM (Umatilla). 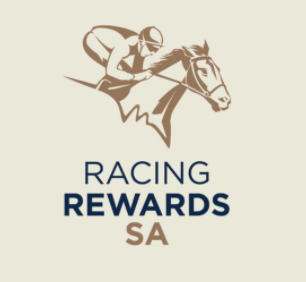 7 wins-1 at 2-to 1400m, A$455,250, VRC Standish H., Gr.3, MRC Manfred Welter H., Members Raceday at Classic Caulfield H., SAJC Christmas Flying 2YO H., VRC Australian Lamb Company H., 2d VRC Standish H., Gr.3, Century S., L, Bob Hoysted H., L, MRC Evan Evans Cup H., Magari H., 3d AJC Galaxy H., Gr.1, VRC Salinger S., Gr.1, SAJC Jansz S., Gr.3, MRC WJ Adams S., L, Evan Evans Cup, 4th MRC Victoria H., Gr.3, SAJC Smoke-Free SA S., Gr.3, MRC JRA Doveton S., L, SAJC RA Lee S., L, VRC Bob Hoysted H., L.
Maduro. 13 wins-1 at 2-to 1400m, A$325,710, SAJC Scott Group Of Companies H., Come to Allan Scott Park H., Scott Group of Companies Flying H., Distinctive Homes H., Country Challenge Series Final, Silks Brasserie Flying H., Gold Ace at Glenrae Stud 2YO H., Allan Scott Park H., Trims H., Centro Properties Group H., Scott Group of Companies H., Honda H., 2d MRC Premium Class Package H., SAJC Allan Scott Park Morphettville H., Myer Centre H., Oakbank RC Mix 102.3 H., 3d SAJC Scott Group of Companies Flying H., Distinctive Homes Flying H., 4th SAJC Fulham Park P., L.
It's a Myth (Sepoy). Placed at 2 in 2016-17, 2d SAJC Queen Adelaide S., L, Gawler & Barossa JC Sanders Fodder 2YO P., SAJC Schweppes Oaks 6th May 2YO H., 3d SAJC National S., Gr.3.